There might be nothing so frustrating as working for an entire day, feeling exhausted when the day’s over – and getting nothing done. How is this possible? More than once, when scanning back through my day I’ve felt bewildered. I’m tired so I must have been productive, right? A phone call, a quick drop-in meeting, a few emails, driving off to a meeting, replying to a text, checking how my latest post did on Facebook. I barely get to the big task on my list and it’s time to pick up my daughter for piano. Over the weekend I re-read the sparkling book The Personal MBA by Josh Kaufmann, and one of his chapters perfectly diagnosed my conundrum. It’s called the cognitive switching penalty. The gist: we think we can multi-task, but we can’t. We all actually only do one task at a time. Multi-tasking is a myth. When we constantly switch between several tasks (quick question, quick email, quick trip to the fridge, quick email, quick yada-yada-yada…), our productivity plummets. Living in a distraction-laden world, we struggle to get meaningful work done. But even setting the scope of eternity aside, spending a day getting nothing of lasting value done is just plain unsatisfying. All of us long to really make a lasting impact on the world with our work and not waste our time on trifles and minutia. We all love the feeling of getting a major project done – and rue the feeling of time wasted and days frittered away. This may seem like an obvious place to start. But for most, it’s revolutionary. Before you crack open your computer for the day, make a plan. What needs to get done today? What are the top three things I’ve gotta get done today no matter what? And then what are the the things I’d like to get to if I have time? A tool like the emergent task planner can be tremendously helpful. You have to start with making sure that your big goals for the month, quarter or year get prioritized in your actual daily task list. Here’s where it starts. Distinguish between being effective and being efficient. Peter Drucker, the father of modern management, said it the best: “Efficiency is doing the thing right. Effectiveness is doing the right thing.” There’s no sense in being efficient and getting a long list of things done – if they’re the wrong things to be getting done in the first place. The first distinction that needs to be made when trying to plan a productive week is: What’s really important here? What will really turn the dial and lead to long term value? When planning out my week, considering the thousands of details that pull my attention here and there, always start with distinguishing between effective and efficient, between the big projects that are important and the zillions of little tasks that are urgent. Once you’ve prioritized what’s most important, front load your days with “makers” tasks over “managers” tasks. Tech investor Paul Graham makes the helpful distinction between two kinds of schedules: “makers schedule” and “Manager schedule.” Makers tasks are essentially creative. These are right brain activities that require abstract thought, concentration, and large blocks of times. Managers tasks are “get-er-done” types of items – sending an email, typing a memo, hanging a picture, visiting a patient, teaching a short lesson. These are left brain activities that require efficiency, a tight schedule, and a clear task list. When I plan my daily schedule, I always place my “makers tasks” in the first third of the day, knowing that the afternoon – when my circadian rhythms naturally want to make me fall asleep – are a better time for less intellectually challenging activities. For makers tasks, get quiet and focused; for managers tasks, make a list and start knocking them out. I recommend time blocks of at least 2 hours for managers tasks. And on the makers tasks, be conservative. You cannot build a Fortune 100 business plan in 2 hours. Set conservative goals on how many big projects you can get done in a day. 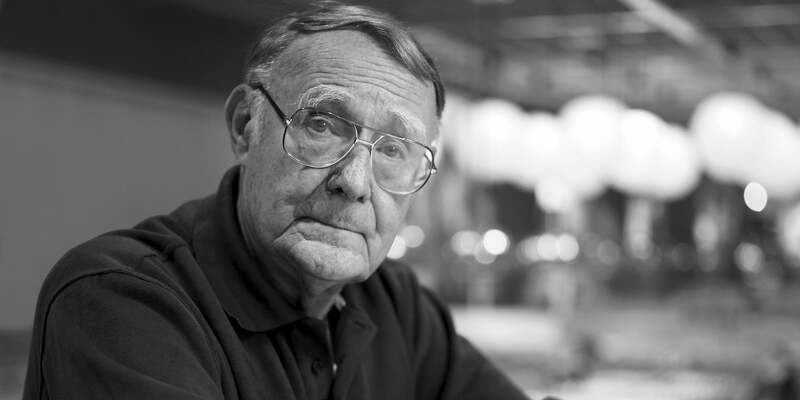 Ingvar Kamprad, the founder of IKEA, might be the most effective and efficient person on the planet. The business processes he’s built for quality, lost cost furniture are legendary. How does he get so much done? The Ingvar Principle. Here it is: assume every task takes just 10 minutes. “That’s ridiculous!” we retort. “Most of my tasks take hours and hours!” Yes, yes, yes. But consider this: most of the time we avoid big projects because our brains are overwhelmed by the thought of spending hours and hours doing the same thing. It’s too big, we feel. And so we answer an email. But 10 minutes? That’s simple. I can spend 10 minutes on a task. It’s simple and doable enough to get started, which is the hardest part of any project. Even for much larger tasks, like writing a book or crafting a business plan, break it up into tiny parts that will take you no more than 10 minutes to complete. And watch yourself overcome psychological barriers to even the most challenging project on your plate. Make a “Not To Do” list. Decide what’s unimportant on your task list, and just don’t do it. Watch and see if anybody misses that task not getting done. It’s amazing how you can whittle away the minutia with just this step. Make an actual list of things you know you shouldn’t be doing — those time wasters or things you know you could delegate to somebody more competent than you. This is perhaps the most valuable insight of this article. Shut off the internet. Really. Social media and the latest depressing, anxiety inducing news article will likely add nothing to your soul, your work or your family. Take the example of reading. Tim Keller was once asked what he reads. Keller said essentially, You have to read books. Not articles. Shut off the internet. For Keller, the really valuable cultural conversations still happen in the “slow” medium of books. Books develop full arguments. Reading on the same topic for 10 hours has more of an impact on us than reading the first paragraph of an internet article and then moving on. Actually, this kind of reading is more likely to welcome us into what Nicolas Carr calls The Shallows. We live in an age of distraction. We know this. We also know that most of us need the internet to work. So, let’s do this: check social media, email, and other “fast” media at the end of the day, NOT the beginning. Save your morning hours for creativity. The swarm of low level tasks can wait until the afternoon. Productivity isn’t everything. We can make too much of Paul’s injunction to “make the most of every opportunity, for the days are evil.” In a harried American culture, we often just pile on more and more until exhaustion ensues. Yet getting nothing done in a week can lead the heart also to a frenetic weekend busyness that frets over DIY projects or getting the kids dressed to go to Chik-Fil-A. Far better to work well, rest well, and return to the week ready to offer our time and skills to serving our neighbors. Thanks, Sparzak. Glad you enjoyed. Good stuff here. I’ll definitely come back to this one! Glad you like it, love!